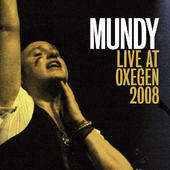 On a typically wet Friday evening at Oxegen in 2008 Mundy and his band played a very special set in a large tent to 10,000 people. We recorded it for prosterity and have made it available exclusively on itunes. It features all his hits, ‘July’, ‘Mexico’, ‘To You I Bestow’ and very special guest Sharon Shannon on ‘Galway Girl’ which literally bought the roof down.